Hundreds of kids suffocate every year because they get caught in one of these hiding places and cannot get out -- either the lid is too heavy, or the lid has a latch on the outside with no way to release the latch from the inside. 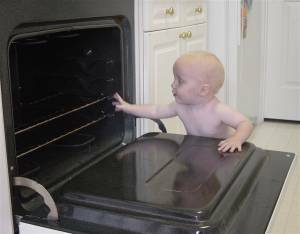 In addition, things like coolers, ovens and refrigerators are insulated, so you will not hear your child even if he/she is screaming. These sorts of appliances and containers are not just in the home -- keep in mind the things that you have in the garage, the storge shed, the barn or the camper parked out back. NEVER leave a child unattended for long periods of time. If your child is missing, check the hiding places listed above. Remove latches that might keep lids locked shut if a child gets inside. On old appliances, completely remove the doors. Talk to your child about this problem and ask him/her to stay away from these situations. Most kids who die this way are between ages 4 and 7.